As you turn right on to the Lower Richmond Rd from Putney Bridge you may well have noticed the recent revamp of a barbers shop - turning the tired shop in to Putney's latest Gents Hairdresser A&N Style. 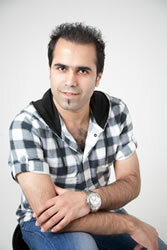 It is the project of owner & barber Nabi Salehi who is celebrating the re-launch with an unusual and challenging event. Nabi & his team are attempting to break the current record for number of haircuts in a 24 hour period and this will be judged by a team from the Guinness Book of Records. What made you decide to take the Record Breaking Challenge? I was trained to perform the highest quality at the fastest speed. As soon as I saw the world record I knew I could beat it. This challenge and the opportunity to raise money for charity convinced me I had to go for it. How many slots have you filled – how many have you got to fill? We need 500 people during the 24 hours and we already have over 150 signed up. If someone wants to take place what do they need to do to sign up? How much will it cost them? They should call me on020 8785 4725 or pop into the shop to book a slot. The haircut will be free but I do hope they will each donate at least £5 on more to charity. Why did you choose the RHN as your chosen charity? Recently some famous stars have announced they are bipolar. Also I’m surprised how many of my clients were not aware of the good work being done by the RHN. It is the best hospital for mental illness in the UK. How much do you hope to raise? I hope to raise over £3,000 for the hospital. In addition to the donations from the hair cuts I also have two local sporting pieces memorabilia available for auction. I have a Fulham FC singed t shirt and Harlequins Rugby Club singed t shirt- I will let you know how you can bud for these soon! What made you choose Putney as the place to open your barbers Nabi & how long have you been in Putney? Nabi pictured left said Putney needed a 5 Star gents hairdressers when I came here 7 years ago. We are amongst the best in London - no mullets or spikes here. No Sir! You have recently refurbished the shop – what made you decide to do this? This is a thriving and upcoming part of London and people expect the highest quality of service and decor. What do you like about Putney as a place to work......Our clients are so interesting and many of them are famous. Each day at work is just so interesting. So why not help Nabi reach his goals both in terms of breaking the record and also raising a great amount for the local charity the Royal Hospital for Neuro-disability - and if you go let us know how it went - before and after photos welcome!